Legumes are an extremely popular crop for farmers and consumers, but most do not know the agricultural and environmental benefits of using them during crop rotations. Some grain legumes – such as soybeans, peanuts, pecans, and other notable beans and nuts – are cultivated for their seeds and used for food consumption, oil production, and other industrial purposes. Other pasture legumes, like alfalfa and clover, are grazed by livestock. But what’s so special about this common plant group? The answer lies in its ability to fix nitrogen and help sustain biological life within soil. An Italian pole bean sprout, a popular and tasty legume. Image via MaretteSyndrome. Most legumes, as we know, contain symbiotic bacteria called rhizobia. To be “symbiotic” is to have long-term, usually mutualistic, interactions with other species. After legume seeds germinate, rhizobia in the soil invade the root hairs and move towards the root of the legume. The bacteria multiply quickly in the root, causing the inflation of root cells to create nodules. These rhizobia are located within the root nodules of the legume’s root system. These bacteria have the extremely unique ability to fix nitrogen – which cannot be readily used by many microbial organisms – from the atmosphere, or from molecular nitrogen, into ammonia. The ammonia can then be converted into its usable form, ammonium. With this arrangement, the plant’s root nodules become an excellent source of nitrogen for the legume. Nitrogen is a key element in crop productivity and protein production. With this being said, legumes tend to be highly rich in protein. In crop rotation, or the practice of growing many different types of crop species in the same area for many seasons, legumes are often utilized. By alternating between legumes and non-legumes, the soil gains sufficient amounts of usable nitrogen exerted from the legumes to better the livelihood of the non-legumes. On the other hand, when a non-legume is harvested and removed from the soil, all of the crop’s nutrients leave with it, leaving the soil with less nutrients. Legumes help keep usable nitrogen in the soil, even after they’re harvested. This process reduces the need for nitrogen-rich fertilizers, and helps sustain usable nitrogen concentrations in soils for future crops. Therefore, legumes can be considered a “green manure.” Legume plants can then be seen to hold economic value when money is saved from the reduced use of commercial fertilizers, which abate the potential cost of cleanup and alleviate the negative impacts of these chemicals on freshwater species. 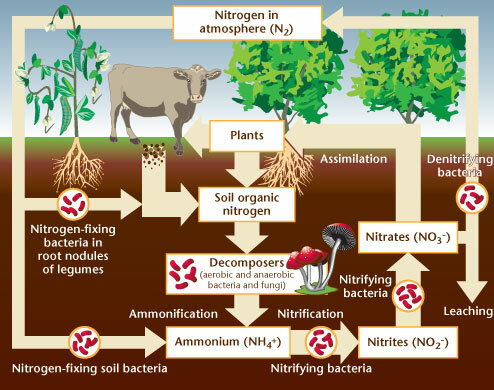 The nitrogen cycle in agriculture. Image via WSU College of Natural Sciences. The use of legumes in agriculture has declined in the last few decades. This trend can be explained by the increased use of nitrogen-rich fertilizers since the mid-twentieth century. Since the Green Revolution, genetically modified organisms (GMOs), fertilizer, pesticides, and agricultural mechanical tools have become commonly used. As globalization has increased consumer demand and opened doorways to produce goods outside of our nation, the use of GMOs and fertilizers has sky-rocketed in order to meet the needs of consumers in a swiftly growing economy. Because fertilizers are efficient in regards to time, they became more and more available and popular among farmers. Unfortunately, GMOs and manipulated crops don’t serve well for the sustainability of the environment and its soil organisms. However, as we begin to better understand the relationship between the environment and the economy, we learn that environmental sustainability, and the use of organics, benefit local and non-local economies more so than the use of hybrid plants in the long-term. A negative consequence that synthetic fertilizers create (that legumes do not) are large amounts of nitrogen from fertilizers that runs off into waterways, where it creates huge algal blooms. The overgrown, nitrate-fed algae consume dissolved oxygen in the water, suffocating aquatic life and creating “dead zones” in lakes and oceans. Nitrogen-rich waters then contaminate drinking water and can cause human health hazards. Synthetic fertilizers also release oxidized nitrates (which help create smog), act as greenhouse gases, and destroy the ozone layer that protects us from harmful sun rays. Additionally, nitrogen oxides act as a main player in the process of creating acid rain in the atmosphere. And, as you can imagine, “acid rain” is as rotten as it sounds. As we dig deeper into environmental issues, we see that the easiest and most economically-efficient ways of improving soil quality in a sustainable manner lie within the use of our natural resources – not the use of synthetic, man-made concoctions.